Rogue Credit Union, a financial cooperative in southern Oregon, wanted to take its community outreach efforts up a notch. 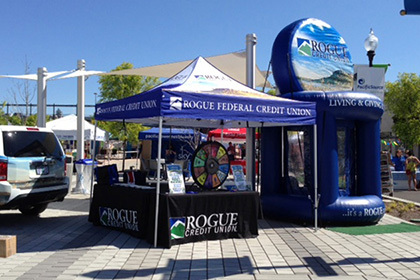 After receiving a referral from a credit union in Idaho, Rogue chose Landmark Creations to produce its inflatable cash booth. Cash booths aren’t just for financial institutions. They have the same impact when used by practically any organization. After all, who doesn’t want to win free money? Looking for an inflatable that will atract attentin at your summer events? Browse our online galleries!